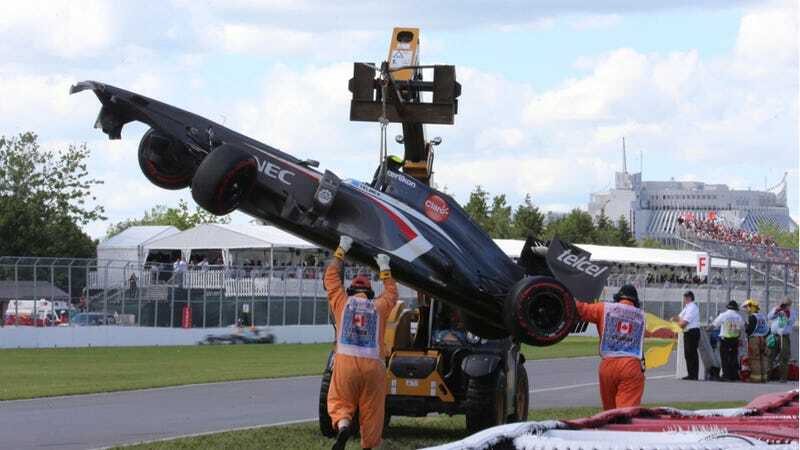 A track worker was killed immediately following the Canadian Grand Prix in Montreal today as he was helping clear Esteban Gutierrez's crashed Sauber from the track. As he did this, he stumbled and was hit and run over by the recovery vehicle. The worker was not immediately identified, though the FIA said he was a member of the Automobile Club de l’Île Notre Dame. It is not clear as of this writing if it was one of the two workers depicted in the photo above removing Gutierrez's car from the track. Unfortunately, being a track worker is a dangerous job, and this isn't the first time such a tragic incident has happened. It is uncommon, however, for such accidents to happen after the conclusion of the race itself. We'll update you with more information as we have it. UPDATE: Twitter user F1McG originally posted this photo, since removed, of the immediate events leading up to the incident, and this photo of the immediate aftermath. Before you a look, a warning to the sensitive or very squeamish that though there is no gore, there is a picture of the victim. UPDATE #2: The victim of the accident, 38, was a ten-year veteran of the track. He was conscious immediately after being injured, and was treated by a nearby doctor within 30 seconds, though he passed away upon arriving at the Hôpital du Sacré-Cœur de Montréal, according to the Montreal Gazette. The man's family has been notified, though they do not wish to make a public statement nor identify the deceased at this time, according to the hospital.